It’s 2013 and Janet Shamlian, BJ ’84, stands in front of a windowless plane in an aircraft hangar in New Mexico. The plane, the size of a semitruck, is fixed on blocks and bears the symbol of the United States Air Force. The screen flashes back to the hangar. Janet Shamlian, BJ ’84, gives a report at Holloman Air Force Base in New Mexico for NBC’s Today Show in 2013. Shamlian’s love for broadcast news goes back to her childhood. When she was young, Shamlian would transform her family’s kitchen into a studio space as she would use a soup can microphone to deliver the nightly news broadcast, giving her version of the day’s events to her parents every night. Years later, as a student at the Missouri School of Journalism, Shamlian finally got to deliver her own newscasts at KOMU. Today, Shamlian travels the world as a national correspondent for NBC. Her stories appear on The Today Show, Nightly News, Dateline and CNBC. Shamlian poses for a photo with the other members of the 1982 Homecoming Steering Committee. While she was attending Maine South High School in Park Ridge, Illinois, Shamlian worked as a reporter at WMTH, a local radio station run by student reporters, and Southwords, her high school newspaper. However, reporting the latest happenings from the halls of her high school was not enough for her. One day, she called up the Park Ridge Advocate, a local paper she wanted to intern at. The paper didn’t have an internship program, but that didn’t stop her. “I kind of forced my way in,” Shamlian says, laughing. There, she first felt the rush of working in a “real” newsroom. Shamlian relished the print experience she got at the Advocate and in high school. Still, she remained more drawn to radio and TV, rather than newspapers, and began looking at the best schools for broadcast journalism. The University of Missouri made it to the top of her list because of the hands-on training experience she knew she’d get at KOMU-TV. The station is the only university-owned commercial TV station in the U.S. that uses its newsroom as a working lab for students. 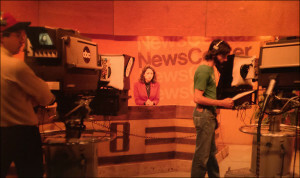 Janet Shamlian sits behind the newsdesk at KOMU-TV during her junior year as a broadcast journalism student. 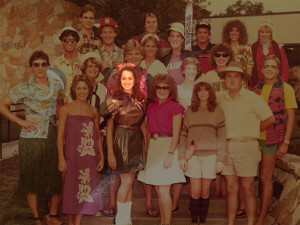 When Shamlian arrived on the University of Missouri campus in 1980, she got involved right away by joining a sorority. She was also a member of the homecoming steering committee with fellow MU graduate (and singer and songwriter) Sheryl Crow her senior year. Despite being involved on campus, Shamlian was focused on her broadcast journalism classes. Her balancing act of school, extracurriculars and 15 hours a week at KOMU gave her the first big taste of what it takes to manage a strenuous workload. One day in college, Shamlian was reporting for KOMU when the newsroom got the call that there had been a single-engine plane crash. She headed out alone, carrying the bulky, 1980s-era camera equipment to the wooded area of the accident. She had to fight her way through the thick brush, while struggling to keep her high heels from sinking into the ground. She set up her tripod, shot b-roll and a standup, and wrote and edited the piece when she got back to the newsroom. Shamlian says that the final package she produced was the best work on her tape by graduation. Janet Shamlian, BJ ’84, shares her travels around the world during one week in February 2015 on her Twitter account @JanetShamlian. Shamlian remembers many of her professors fondly but Professor Kent Collins made a lasting impact. He worked with Shamlian on many of her reporting assignments and taught Shamlian that everything done in newsrooms is a collaborative effort, not a solo pursuit. “Kent Collins was like my spiritual, journalistic guru,” Shamlian says. 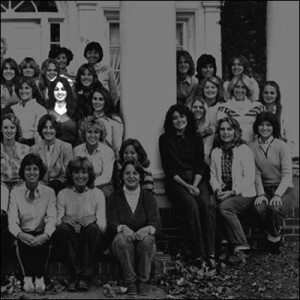 Janet Shamlian poses with her Delta Delta Delta sorority sisters in the Savitar yearbook in 1981. Photo: MU Savitar. Mackie Morris was another influential professor who emphasized the importance of quality writing in on-air reporting. “Good writing is the passport to a job in journalism,” Shamlian says. Shamlian says that even today, she gets questions from fans about who writes her material – sometimes in broadcast, people assume on-air talent aren’t reporters. “I tell them that of course, I write all of my material,” Shamlian says. In 1984, Shamlian earned her degree in broadcast journalism. 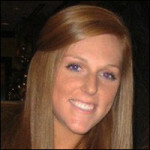 She sent her KOMU reel to stations across the country and was hired at an NBC affiliate in Grand Rapids, Michigan. Shamlian worked as a general assignment reporter at WOOD-TV in Grand Rapids for three years before she took a job as a reporter and anchor at KHOU-TV in Houston. While in Houston, Shamlian met a young attorney named LeRoy Melcher III who lived right behind the station. She jokes that’s the only reason they met, because she worked all the time. They married in 1991 and decided to move to Chicago, Shamlian’s hometown, where she worked at NBC-owned WBBM-TV. Shamlian and her husband decided to return to Houston in 1997, where she worked part-time at KPRC-TV. When she was pregnant with her second child, she decided to take a break from journalism and be a full-time mom. Shamlian spent the next seven years caring for her family, which grew to include five children. Life was good, but Shamlian couldn’t shake her desire to be back in the newsroom. So in 2004, with the encouragement of her husband, she decided it was time to return to television. Shamlian was nervous, though. “Once you get out of television, it is very hard to get back in,” she says. Shamlian’s goal was always to work for a network, and all her previous newstations had been NBC affiliates. So with her sights set on NBC, she flew herself to New York. She had no meetings set up but she was armed with clips of her best work, talent, determination and persistence. She managed to snag a couple of meetings at NBC. After completing a writing test, Shamlian was hired as a freelance reporter. She continued to prove herself with every story that she reported, and after 18 months she joined the team as a full-time correspondent. 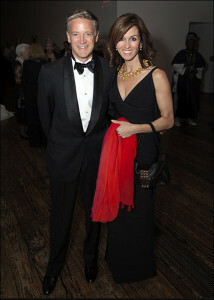 Janet Shamlian, BJ ’84, poses with her husband, LeRoy Melcher III, at The Menil Collection in Houston, Texas in November 2012. Today, Shamlian’s ears perk up whenever the phone rings. As a correspondent, she is always on call and often has to be ready to catch a flight with only a few hours notice – and she never knows what her new assignment will be. With five kids and a demanding job, Shamlian says the support from her husband is invaluable. “The way I am able to do it is not because I have any superpowers,” Shamlian says. “It is because I have a super husband.” He’s self-employed, which gives him a more flexible schedule. While Shamlian’s hours are sometimes taxing, she firmly believes that it is important she set an example of a working woman for her three teenage daughters. Shamlian’s favorite stories are the ones she calls the “making-a-difference stories.” Recently, Shamlian spent a day with Houston Texans Defensive End J.J. Watt. She wanted to learn more about his foundation, which provides after-school opportunities for children to become involved in athletics and teaches children about things such as teamwork and accountability. Shamlian loves reporting stories that have heroes and depict the positive differences individual people are making in the world. Janet Shamlian, BJ ’84, interviews Houston Texans Defensive End J.J. Watt in his Wisconsin home in January 2015. She spends hours every day searching the Twitter and the Internet for stories to pitch that have an upbeat tone. These stories may not be as flashy or provocative as some of the doom-and-gloom stories that dominate headlines, but they are the ones that Shamlian feels are more important to tell now than ever. Shamlian’s aggressive determination has helped her to achieve a successful career and a happy family. Anna Cole studied convergence journalism and strategic communication at the Missouri School of Journalism and graduated in May 2015. She earned her Bachelor of Arts in human development and psychological services at Northwestern University in 2013. She is originally from the small town of Mondovi, Wisconsin. Cole’s interest in public relations was sparked when she served as a social content intern at FleishmanHillard‘s St. Louis office in 2014. Graduate assistant Annie Rees helped Anna Cole develop this Profile in Success.